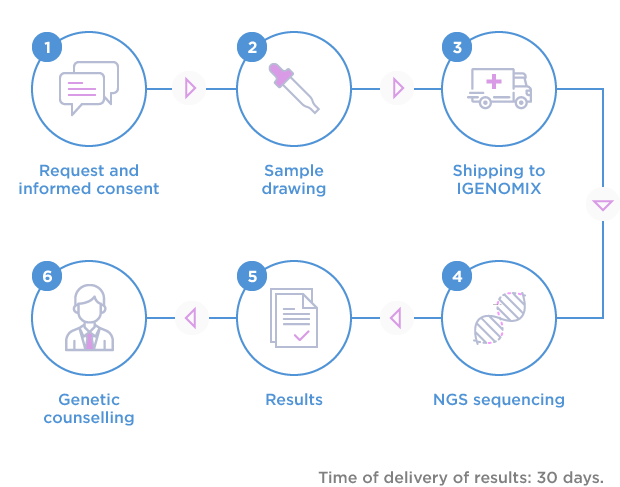 Oncodona is a complete genetic screening test that analyzes 21 genes related to breast and ovarian cancer. The objective is to locate mutations that increase the risk of developing these types of cancer. If positive, can be used to adopt follow-up and personalized early detection measures of the patient and their relatives. This test is focused on genes associated with clinical management guidelines, which are internationally accepted. Oncodona offers genetic counselling by expert staff. In the case of people with mutations, there are several preventive options to deal with the cancer risk. It may also have important health implications for family members, and even for future generations. A negative result means that the patient does not have an increased risk. Their risk of suffering one of the types of cancer analysed by the test is the baseline risk of the population. Oncodona is a complete test for all women who want to have the maximum information about their personal risk of developing cancer. and BRCA2 negative genetic test. a mutation in up to 4% of women.